First of all, this tool is outstanding at what it does. So what does it do...? 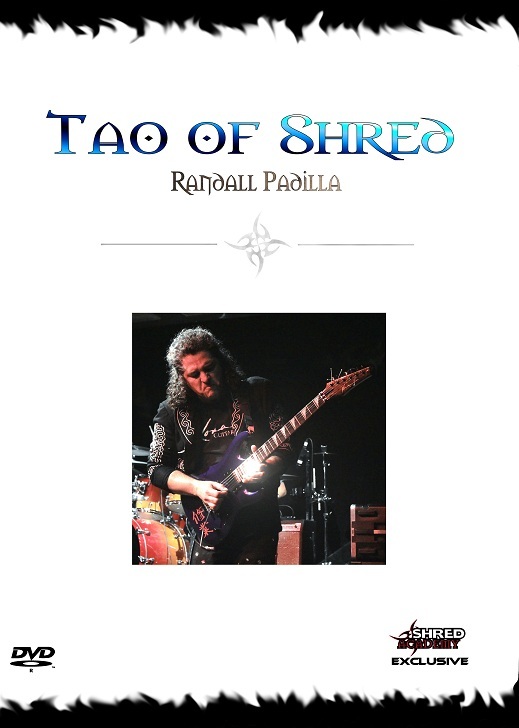 - Covers everything you will need: everything from introducing you to scales and basic picking exercises right up to 6-string sweep picking, advanced tapping and exotic ascending/descending runs! Whammy-bar tricks, harmonics, you name it! - Gives you more than you could ask for: thanks to the free updates for life, this tool now includes a fretboard memory tool, a progress chart so you can track your progress, a speed enhancer to monitor and push your speed to new levels, backing tracks to practice with, a brand new flash user interface, and lots more! All added in the free updates. This program evolves with you and keeps improving. - Makes darn sure you improve: not only does this tool include over 60 pages of exercises for you to drill through, it helps you build a practice structure, has a special section for lazy learners and unmotivated people, and a 'rusty finger workout' for those who haven't been playing as much as they ought to! - Gives you plenty of extras! 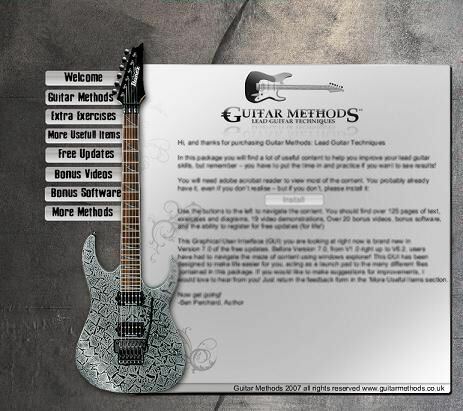 : There is over 20 bonus videos for your entertainment and education, a guitar tuner, metronome, printable chord charts, 5,000 tabs and all sorts of other extras, including access to the guitarmethods website where you can access the free updates and more. This is less than HALF the package! To be a good guitarist you need more than the tricks and techniques - you need to know how to create music! Is the 'minor pentatonic' one of the few scales you know? - Essential info to give you the knowledge you need. Everything is kept simple and easy to digest, you will not be overwhelmed with too much. - Play along with the exercises as you progress through the text. You can play the CD in any CD player, so you do not need to be at your computer - or you can put the CD into your computer to slow-down or speed-up each track! - An addition video is provided that talks you through the ideas in the text with more examples and helpful tips. - Includes backing tracks to practice your new improvisation skills, and example solos to give you ideas of what you might do with them, to draw inspiration from. Everything you NEED to know on improvising, and NOTHING you don't!! 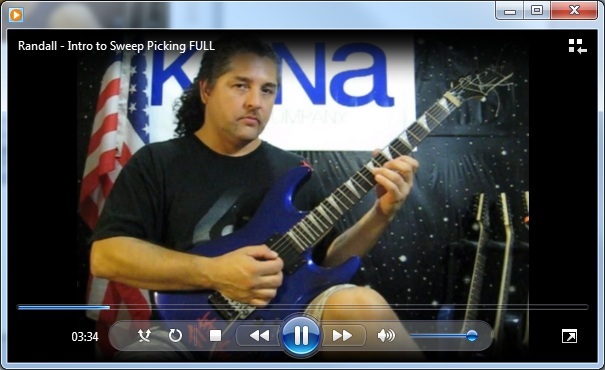 Learn to master the art of improvisation without being stuck in the pentatonic scales! Over 40 pages of text to give you all the knowledge and know-how! Over 40 Audio tracks playable in any CD player, or play in your computer to adjust the speed! Plenty of backing tracks! Great for working on your new skills! Speed-up or Slow-down to any speed. 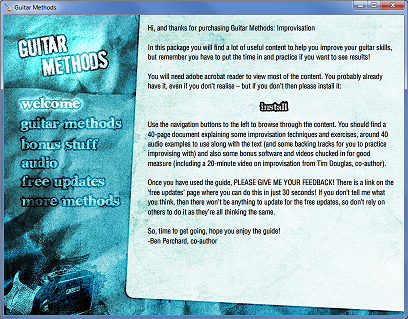 Free Bonus Software, including a tuner, metronome, fretboard tools, and much more! 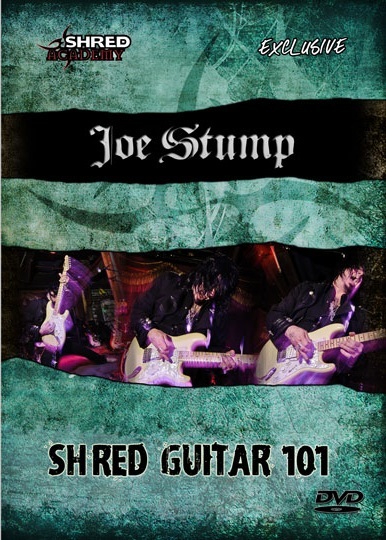 Free samples of some other Shred Academy items, now and coming soon! Access to free support for unlimited free advice! So right now you are probably thinking that, at this price, this is either the best value guitar item you have ever seen, or is probably just some rip-off/scam junk. No doubt the customers of Guitar Methods: Lead Guitar Techniques thought this as well. But with 10,000+ customers to date, we have only ever had to issue 3 refunds. This item is just the same, and comes with a 100% satisfaction guarantee. This program will change the way you practice guitar ... forever! See and hear exercises played with real drums and real guitar! - NO MIDI HERE! Get ready to become very good, very quickly! Ever wished you were good enough to play 'that' solo, or 'that' song, but you know it is beyond you? Sometimes to become a better guitarist, and be able to play the songs we want to be able to play, we have to go back to basics, and learn the individual elements that make up a guitarist. And the best way to get there, is to drill through technique exercises that will physically improve each area of your playing, and you as a guitarist, as a whole. The problem is, this can start to feel very repetitive, especially after years of guitar playing, which can often lead to your guitar gathering dust. Some people don't even pick their guitar up because the thought of playing guitar seems more like "work" rather than fun. Not to mention how difficult it can be to find good exerices to begin with, and to browse them all easily. It can all be a bit much. 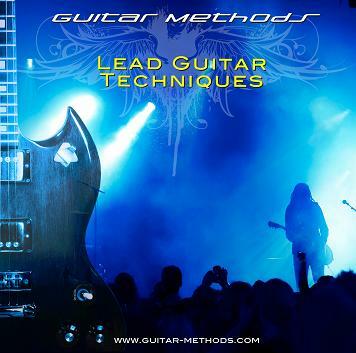 Guitar Methods: Finger Trainer has been developed to solve this problem with fantastic success. 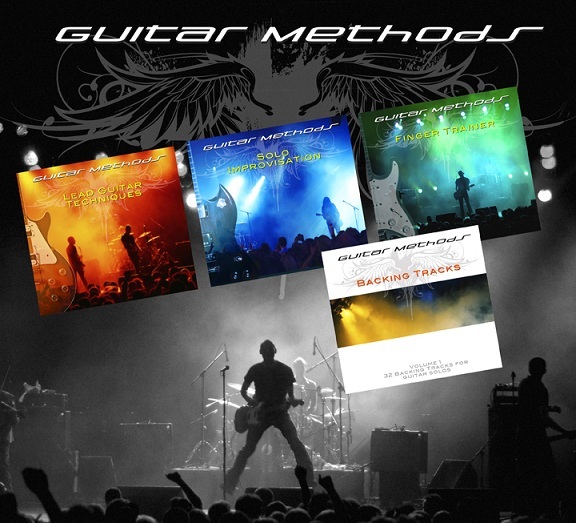 From the creators of 10,000+ selling Guitar Methods: Lead Guitar Techniques and top ranked shredding site Shred Academy, we bring you the latest and best software for mastering that guitar and bringing a whole new lease of life to your favourite instrument. Well we've talked to hundreds of guitarists about this, and decided it's time that practice, and learning new techniques, should be both fun and rewarding. "I want to have a real guitarist to listen to, and play along with, not some synthesized midi system"
"I want to be able to create different ways of playing a practice session, so it's never repetitive and boring"
"I want to learn and practice all the essential techniques of lead Guitar in one place"
"I really need to be able to start simply and slowly, and then build up speed and complexity"
"It'd be great to have something that will grow with me, and challenge me, as l get better and better"
Guitar Methods: Finger Trainer puts the fun back into practice by giving you a band environment in your very own home. 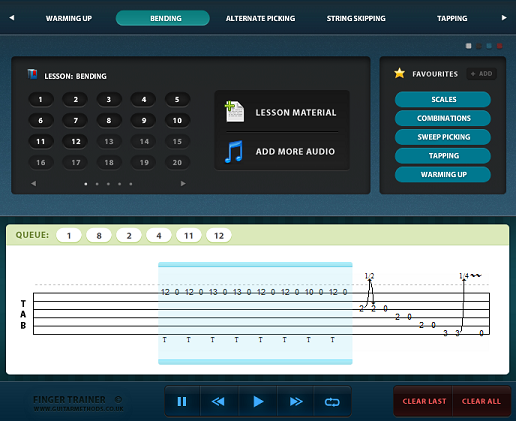 Simply clicking on one of the exercises will not only give you the tablature to an exercise ready for you to learn and work on, but also the audio so you can hear what it sounds like. And not just any audio...! 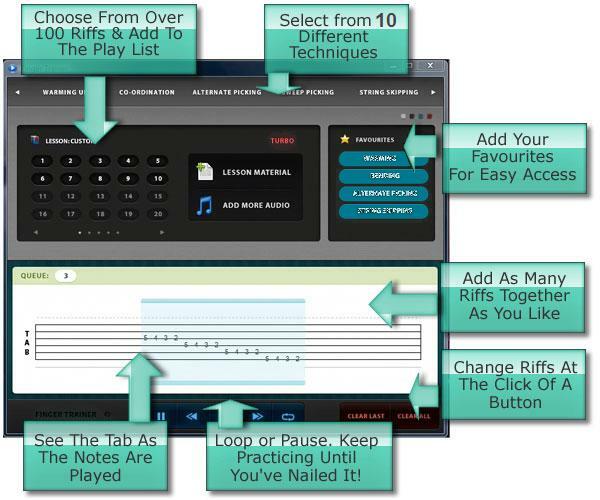 Unlike most guitar/music programs, Finger Trainer does NOT use midi. This program features real drums, and real guitar. Not only will this give you a perfect example of how the exercise should and will sound like, but it also gives you something perfect to play along with. Playing along with power tabs (or nothing at all) might be someone's idea of fun, but i'd rather have a full set of drums and guitar behind me when i practice! One of the great things about this program is the loop function. Simply add 1 or more exercises to the queue, click the loop button, and hit play! Now you will hear the exercises played out with drums and guitar like a real band environment, with the tabs moving along in time with the music - repeated SEEMLESSLY as 1 long track, over and over until you hit stop. Perfect for mastering each exercise, one at a time! Adding multiple exercises with the loop function enabled will also allow you to work on a number of exercises at once, keeping things fresh and interesting. ... And not only do you get these 3 amazing tools, but we'll also chuck in 10 Backing Tracks worth another $9.95! With free updates for life! Quality Guitar Tuition doesn't get better than this! OR more affordable!